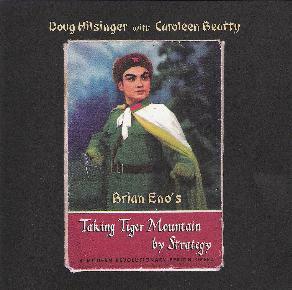 Doug Hilsinger with Caroleen Beatty - "Brian Eno's Taking Tiger Mountain by Strategy"
Well, this has always been one of my favourite Brian Eno CDs and after most of my CDs were stolen this was one I quickly replaced when I saw it used. Anyway, it is not often you hear of an individual taking on the remake of a classic record, which has quite a complex arrangement. Doug, who plays all the instruments, is joined by Caroleen on vocals (and handclaps!). This is impressively done and while sonically not equal to the original, I was happily surprised at how much I enjoyed hearing this a few times (and of course going back to hear the original version in between), and so was Brian Eno when he heard it. I can’t see how you won’t enjoy this if you have ever heard the original. It is not an exact copy of the LP, musically, but quite close. Doug uses only guitars and no synths to replace parts from the original LP. Great stuff. For more information you can visit: http://www.saucefaucet.com/tiger.html.